Regarding the SACD surround mix: The best way to describe this remix is 80% original mix, 20% additional recording (instrumentation from ’73/’85). To sum it up, for the most part you are listening to the original with incredible separation! 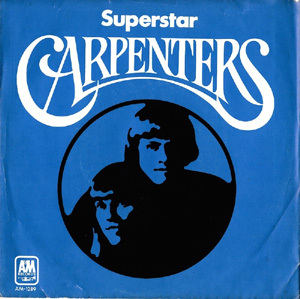 A case in point is the Leon Russell/Bonnie Bramlett composition, Superstar, one of Carpenter’s most beautiful arrangements. The song was first recorded on Joe Cocker’s Mad Dogs and Englishmanalbum with Rita Coolidge on vocals and Leon Russell on piano. 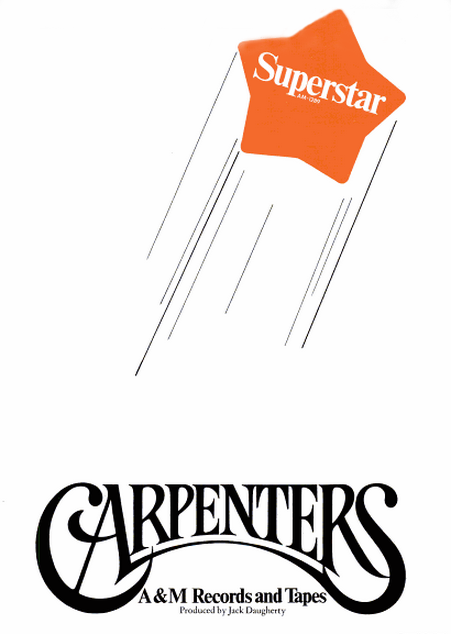 But Richard first heard its potential as a Carpenters single when a then barely known Bette Midler sang it on the Johnny Carson show. Richard’s arrangement introduced lots of new music that has become so identified with the song, so inseparable from the melody, that when people go back and hear the other versions, they’re overwhelmed by the sense that something is missing from them. Carpenter starts of with a harp glissando using the Eb (V) major scale (the song is in Ab). The glis starts on F and ends on G a 9th above, as the strings come in on an F (vi) minor chord. Just as the harp reaches its G, Richard introduces an opening theme he wrote, played on the oboe. At first the theme anticipates the first few notes of the vocal melody which enters 9 bars later, and then it evolves to an entirely new melody, a sort of variation of the main vocal line. Notice next, in bar 9 [00:20 on the CD], how Richard sets up the main rhythmic theme for the song, a dotted quarter-eighth-half note rhythm on the kick drum and bass, doubled on the left hand of the piano for a really fat, and commanding, sound. Enhancing the fatness of the sound is the way the bass comes into bar 9 by dropping an octave – when Joe Osborn finally hits his low F from an octave above, it sounds like lowest note you’ve ever heard. This introduction to the tune is very carefully crafted to set the mood, and uses orchestral instruments to provide a lush texture. Richard’s opening oboe theme is all most people need to hear to recognize the song. Two groups recently covered the song – Sonic Youth (on the If I Were A Carpenter tribute album) and Chrissie Hynde (under the pseudo-band name Superfan, from the Wayne’s World soundtrack album) – and they left Richard’s intro line untouched. Richard’s use of “call and response” lines is also classic, and typical of his approach to creating cohesion between different instrumental parts. At the top of the second verse [00:52] Karen sings the lyric “your guitar” on the notes G-F-C (recognize this from the oboe intro? ), and this line is then immediately echoed by the violins. For the chorus, RC pulls out all the stops. Hal Blaine’s drum fills coming into bar 26 (“B” on the chart) are accented by Richard’s frenetic electric piano fills. A tambourine plays 16th notes throughout the chorus, adding to the rhythmic build. Karen sings the first line of the chorus, “Don’t you remember you told me you loved me baby,” which is answered by the trumpets in bar 27 with a horn fill that is one of the most recognizable signature lines in all of pop music, filling the space between vocal lines with a bright, Tijuana-brass type fanfare. To many, it would be unthinkable to perform the song without this line. Although Chrissie Hynde left it out, Sonic Youth kept it, transferring it to piano. Coming out of the first chorus, a 10 bar interlude parallels the intro, complete with harp glissando [1:35] and the obligatto oboe. Notice that this second time through the theme, Richard’s grand piano echoes the oboe line in octaves in “call and response” style. Another interesting part of the track is Karen’s vocal performance. Listen to the way she sings the words “far away” (at from 00:34 – 00:37 on the CD) – while holding the word “away” she brings out a subtone in her voice that conveys deep and troublesome emotions. Richard knew her range incredibly well, and his choice of key made moments such as this possible. Karen was also a master at phrasing – in the subsequent words, “I fell in love with you,” she sings just behind the beat – not unlike Sinatra – playing around with the time to impart more depth to the vocal.